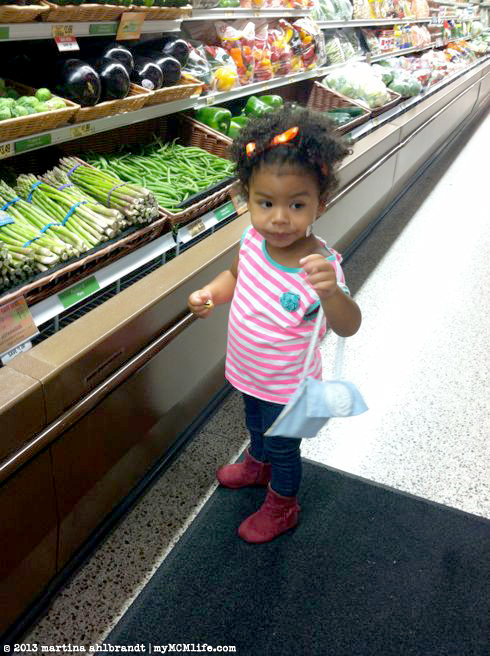 I took this little lady grocery shopping with me the other day. We weren’t in a rush and the store wasn’t busy so when she didn’t want to ride in the shopping cart I decided to let her walk for the first time. She got so much attention with her stylish boots, little purse, (Dora sticker on her face…) and her out-going personality. I think she said hi to every person in the store and had at least 5 conversations about how old she is and what her name. She was thrilled to look at the live lobsters and knew what they were (maybe from shopping with her daddy, I’ve never talked to her about them before). I would hand her a item, like an orange or a box of rice, and she would drop it into the cart for me. I even let her choose a couple things for me… red grapes or green grapes? (She chose red.) Mac and cheese in a fun shape. Fruit snacks (her new obsession), even though we had a box at home. She carried the fruit snacks under her arm for the duration of our shopping. She told me she was carrying them in her armpit. She was usually trailing 5-10 feet behind me as I walked up and down the aisles pushing our cart. At one point I looked back and noticed she would take a few steps, turn around in a circle, take a few more steps, turn in a circle. She has such a passion for life and an incredible joy even at the small things. I decided to follow her lead…take a few steps, turn in a circle, take a few steps, turn in a circle. Her vitality is contagious. And she thought it was pretty great, too. I must note: Publix employees are amazing! They all stopped to talk to her and offer her samples. While we were checking out she told one of the ladies that she had to go potty. She offered to take her for me (I declined that…that would have been weird) but then they offered to finish bagging my groceries and I could pay when we were done in the restroom so my little 2 year old wouldn’t have to hold it too long. After we finished up and paid, the older woman who bagged our groceries pushed our cart out to our van and insisted on loading it all herself so I could buckle Ali in. It was such a wonderful grocery shopping experience! This entry was posted on Wednesday, September 4th, 2013 at 6:00 am and is filed under Family, Family: Precious/Ali. You can follow any responses to this entry through the RSS 2.0 feed. You can skip to the end and leave a response. Pinging is currently not allowed. Wow, what service!!! And what a cutie!